Hi, I am interested in your 1957 Chevrolet 210 (stock #4677-ATL) listed on Autotrader for $126,995. I'd like to get more information about this vehicle and confirm its availability. 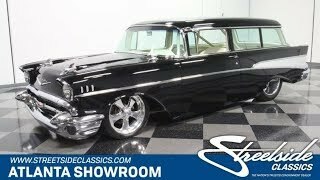 Its one of the most singular of all classics - a storied 57 Chevy - and carries all the hallmarks of an exacting professional build, from its precisely aligned and meticulously finished exterior to its inspired, fully custom interior. Add to that an engine compartment so impressive you could likely sell admission tickets to view it, where a powerplant stands by that adds new meaning to the term big block. Yep, theres no doubt that this 1957 Chevrolet 210 Pro Street Wagon is a bona fide show car of the highest quality. Just to put this Chevys awesomeness into proper perspective, it garnered Top 25 honors at the Tri-5 Nationals, a massive annual event that celebrates the Chevrolets of the mid-50s. Its no quaint local car show - this event attracts in the neighborhood of 5,000 of the best specimens in this niche, so a Top 25 finish is worthy of HUGE props. As such a placement would warrant, the black exterior on this classic is in sterling shape - take a lap around it and youll find no flaws in the paint, which sits under a very strong clearcoat to give it a magnetic shine. Needless to say, the exterior alignment is very precise, with tight even gaps surrounding all of the body panels and, from that ornate, beefy front grille all the way to the back tail fins, every bit of chrome and body trim is in outstanding shape. The glass surrounding this wagons roomy cabin - theres a lot of it - also appears to have been recently replaced and is crystal-clear. Theres definitely no room for slack when youre playing at this level. Offering an interior on a proper par with whats displayed outside would seem a tall order, but this Chevy delivers in that respect as well. Its white interior is fully customized, with plush leather seating in front and back and an inspired center console that houses an assortment of switches sharply contrasting with the fresh black carpeting lining the floor. A full roll cage has been integrated into the mix and is painted to match its surroundings, and the safety it provides comes with no compromise to ease of entry and exit as the door bars have been chopped and capped accordingly. The minimalist look of the dash area is awe-inspiring, with all essential operating readings relocated to a futuristic instrument panel with digital gauges sitting just beyond a billet steering wheel on a tilt column. The rear portion of the car features a seamlessly installed custom covering to house the stereo system, battery and fuel cell. The magic continues under the hood, where a 548 cubic inch V8 - not a misprint! - stands by to power this classic. Its surrounded by an engine bay thats also absolutely show quality by any standards, with its custom fabricated inner fenders and firewall. The powerplant is armed with a polished Edelbrock intake and Holley carb to further maximize its considerable output and exhales into a pair of custom headers to optimize back pressure. Theres a whole host of other upgrades also added to provide an outstanding driving experience and to increase reliability, including the large aluminum radiator that sits up front with its dual electric fans, Wilwood disc brakes at all four corners, rack and pinion steering and an absolutely top tier suspension that includes tubular control arms and coilovers up front and a 4-link Air Ride configuration in back. This spectacularly built Chevy rides on a set of Budnik wheels - 18 in front and 20 in back - wrapped with suitably beefy Mickey Thompson tires. If youre looking for the absolute best in a meticulously constructed, optimally equipped classic, this 1957 Chevrolet 210 Pro Street Wagon is the one to see. Call today!